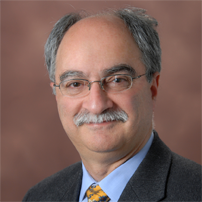 Dr. Atallah Kuttab talks about his turning point into philanthropy. On the 16th of August 2016, Dalia Association opened its second hand shop initiative in an effort to make effective use of the resources available in our country, and to decrease waste going to landfills, thus decreasing pollution. The shop also increases access of needed goods at a budget price, so that everyone in our community can purchase what they need. This will generate a bit of income for Dalia Association, and it will increase the number of our community-controlled grants, so that more people in our community can benefit from these grants, therefore decreasing our dependence on external conditional aid. Dukkan is a physical manifestation of what the Dalia Association is about – strengthening community philanthropy. The Khalil Sakakini cultural center generously offered the space to make the initiative happen. Others, who came from different places in Palestine, volunteered to build shelves for displaying the used items. Young volunteers from different schools and universities volunteered to devise a business plan for managing the shop. Many people donated their used items, because they believe in the philosophy of Dalia of community-controlled development, and mobilizing local resources. On the opening day, visitors rushed through the doors and took home a piece of treasure from Palestinian homes. Interview with Dr. Atallah Kuttab- Founder of SAANED. I am Dr. Atallah Kuttab; I hold a Ph.D. degree in civil engineering, and founded a consulting company, SAANED; where we gather information on philanthropy in the Arab region. We consult individuals and organizations on how to manage foundations and social enterprises, we also guide donors on the best way to give, and provide them with the tools for best practice and effective evaluation for the philanthropy sector as a whole. I am also a founding member of the Arab Human Rights Fund, where we provide support for the realization of all human rights in the Arab region. What attracted you to the world of philanthropy? The transformation from the engineering world to philanthropy was in fact gradual. In the eighties, I was consulting for several international organizations like UNICEF, Save the Children, and Oxfam. The eighties was renowned as “the decade of water”, because the United Nations was concentrating its work on water treatment. Therefore, I was engineering water facilities for the treatment of wastewater. During my work in this field, and what you could call the turning point, was when I evaluated one of the projects of water treatment implemented in one of the Arab countries, worth 50 million US dollars. From an engineering point of view, the project was implemented perfectly, however from the social point of view; the local community did not use the treated water at all! So the investment was not worth it! This is what I learned: the social factor is much more important than the technical (engineering) factor in project implementation. The project failed because the engineers did not consult with the local people on their priorities and needs, and this made me notice the social aspect of engineering. How can philanthropy be strengthened in the Arab world, considering that philanthropy in most cases comes on an individual charity level? I consider donations and philanthropy in its different forms something positive in itself. Individual philanthropy is useful; however, community philanthropy is more effective, because individual philanthropy in most cases is not sustainable. Most donations on the individual level serve the goals of the donors, without consulting the needs of the beneficiaries, and in the end, these beneficiaries will come to the donor again asking for more donations. On the other hand, community-philanthropy is more sustainable. When you support community priorities, the community itself will feel more independent and seek funding opportunities for themselves by themselves, and they become leaders in community-led development using local resources, thus becoming donors, where they encourage other communities in following the same method. In other words, individual donors resemble the first part of the famous saying “give a man a fish and you feed him for a day; teach a man to fish and you feed him for a lifetime”, while community philanthropy represent the second half of the saying. We should not ignore the individuals, who love contributing towards charity, but they can turn their contribution into something more effective, and this is the role of community foundations: to direct these individual donors to contribute to community-philanthropy, where they will witness sustainable results to their contributions. The Dalia Association, started its new Youth Program “IBDA’”, aiming to revive the active role of youth in community led development. The program includes two pilot projects: Youth in Local Economy Development, currently implemented in six different locations in the West bank, including the rural areas of Ramallah, Jerusalem, and the Jordan Valley; and the Students Project with the Orthodox School of Bethany in Al ‘Eizarya. For the Youth in Local Economy Development Project, the second stage had recently started with meetings and workshops engaging youth in discussions on project ideas, that answers to community needs and priorities, using local resources, and taking into account the environmental conditions of the chosen areas. The project ideas include an element of income generation, thus supporting local economy in the selected areas. At the end of this phase, a public youth voting will take place for the best project ideas that benefit the community. The implementation of projects will start in the next phase, in October. As for the Students Project with the Orthodox School of Bethany in Al ‘Eizarya, the first phase had just begun. A group of high school students, interested in the project, will be acting as grant makers, coming up with initiatives to solve community issues, and organizing activities around a community priority; strengthening by this process certain personal skills like leadership, as well as enhancing their sense of community and their role as active citizens in the community. They entered the hall, looked left and right, and squinted their eyes to locate empty spaces among the seated audience. Their eyebrows rose when they found some empty chairs, they headed towards them, and sat down. A man approaches them holding a pen and paper, he hands it to them, the first man grabs it, signs his name, and gives it to the man seated next to him, who also signs, and in turn hands it over to the woman seated on his right. She signs as well, and then gives back the paper to the young man. He walked back through the space between the chairs towards the front of the hall, and then he handed the paper to Dalia Association’s community programs coordinator, Lina Isma’il. She took a quick glance at the paper, placed it on a small table. Later, the Director of the Municipality of Tuqu’, Tayseer Abu Mfarreh, introduced the audience to the goal of this meeting, held on August 4. He then handed the microphone to Dalia Association’s executive director, Aisha Mansour, who introduced Dalia’s work, and the philosophy of community-controlled grantmaking. A man stopped her and asked, “What sorts of projects do you fund”? She answered, “We don’t know, it all depends on your priorities, I don’t know your priorities, so we don’t decide your needs, you are the ones living here, you know the problems and needs of your town, the decision is in your hands, not ours, we only facilitate”. A moment of thoughtful silence passed through the crowd. Some people started nodding to themselves as though they were saying, “Yes, we are the ones who should decide. We are the inhabitants of Tuqu’, we are the ones who know what our needs and priorities are. We don’t need anyone to tell us what these are; therefore we are going to vote today for our civil society organizations (CSO) and local grassroots initiatives who will make effective change to the town”. After this silence, where Dalia’s philosophy was clearly understood, local CSOs and grassroots initiatives presented themselves and their work to the audience in hopes of getting their votes. After a short break, they all came back eagerly to the hall. The voting began. They all ticked off the names of the CSO and grassroots initiatives that they believed would make a difference. The votes were being counted, and the attendees held their breath in anticipation, some even smiled from ear to ear with excitement. In the end, the winners were Tuqu’ Youth Leaders Group, and Al Ghad Group for advocating the rights of persons with disabilities. Everyone applauded them, and congratulated them on their success. Lina ended the meeting by scheduling another meeting to develop plans to implement their priorities with the winning grassroots groups. In September, they will start implementing their projects and ideas, and the Dalia Association will provide them with mentorship and any needed training and support during the execution phase. 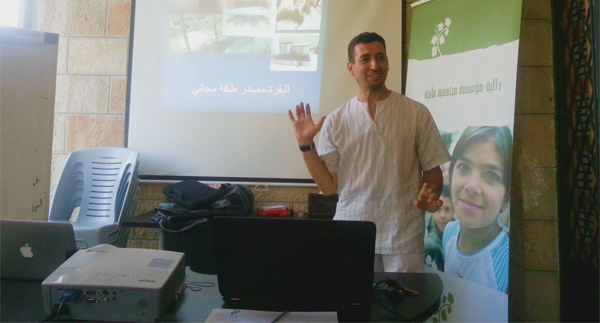 On the 3rd of July, agricultural engineer, Saad Dagher gave a talk on his observations from his recent visit to Cuba. He provided the attendants with successful examples of using local resources to ensure energy sufficiency and food sovereignty within Cuba. The farmers employ effective methods where they use and reuse local resources, such as natural fertilizers from the remains of herbs and animals, and the use of natural pest control among many other examples. As the saying goes, need is the mother of necessity, and due to the diplomatic and economic embargo enforced on the country in the sixties, the citizens came up with effective self-sustainable methods to strengthen their local economy. Source: photo taken from one of the participants. 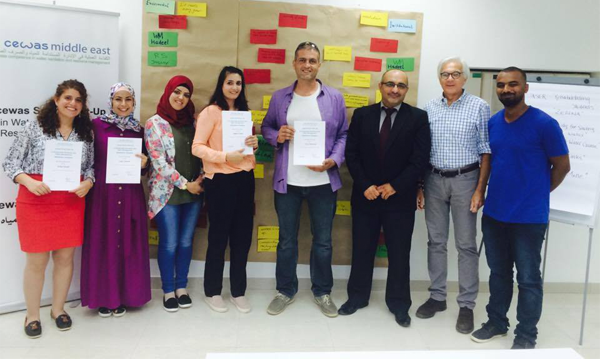 In July, Rasha Sansur, the Communication and Reporting Officer at Dalia, participated in a three-day start up workshop in Bethlehem, organized by CEWAS, on business competence in water, sanitation and resource management. Young and motivated men and women who wanted to make a positive environmental difference attended the workshop. The training focused on coming up with business ideas to be implemented in Palestine. At the end of the workshop, the participants pitched their ideas to the jury. Rasha won an honorary award with her business idea, where she will attend the upcoming workshop for free from CEWAS.